Mary Karr calls Lit “my journey from black belt sinner and lifelong agnostic to unlikely Catholic." Following The Liars’ Club and Cherry, this third installment of Karr’s memoirs chronicles her college years, marriage, motherhood and becoming a college professor -- all achieved while being an alcoholic. Her trip to the bottom and through rehab and recovery are told with brutal honesty, dark humor and grace. Karr overcomes a chaotic upbringing and a genetic disposition to addiction and ultimately finds spiritual comfort in this painfully frank account. Her sense of humor keeps this from becoming unbearably dark yet there is never a doubt that she is in a fight for her life. 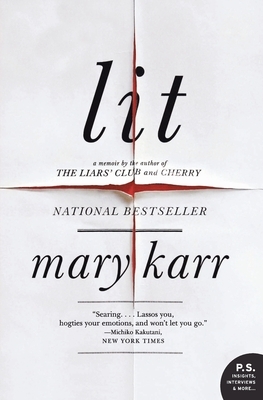 The New York Times bestseller, now available in paperback—Mary Karr’s sequel to the beloved and bestselling The Liars’ Club and Cherry “lassos you, hogties your emotions and won’t let you go” (Michiko Kakutani, New York Times).